Tate's Craft Cocktails has a sister. I couldn't wait to try The Honey Pot, one of downtown Winston's new "all the rage" spots. I had heard mixed reviews, but this one is all positive. (That could quite possibly be, because I was dining with a fellow food writer, one more well known than myself, so we may have received some special attention...but I'm pretty sure it's also because this place rocks.) The interior is minimally decorated - sleek, clean and modern. Almost every table was full. I knew the name "Tate's" attached to it would draw crowds, but I was very pleased when the bite matched its bark. Each morsel I had was innovative and delicious. I was slightly disappointed when I couldn't order a drink off the Tate's menu, being that it's right next door. I thought there might be a secret door or window between the two establishments, so those famous craft cocktails could be enjoyed at the Honey Pot too. 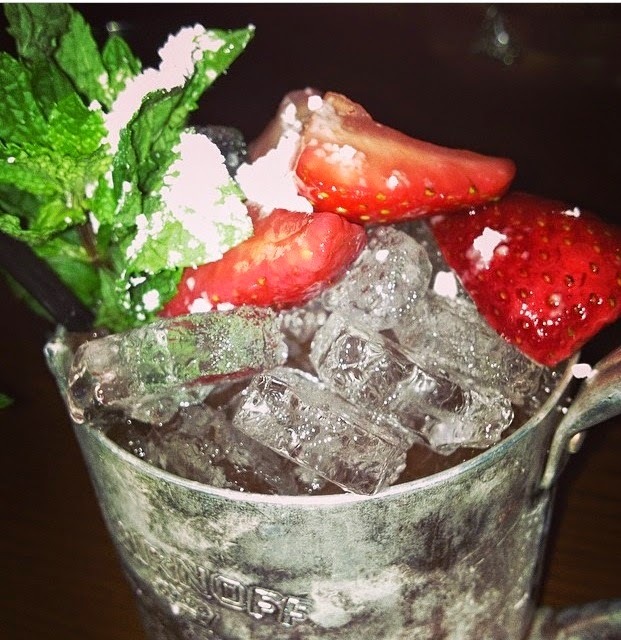 Instead, the bartender whipped up a tasty impromptu Strawberry Mint Julep for me. They even sprinkled Powdered Sugar on top - this Southern gal was awfully pleased! I had never tried the Canadian favorite Poutine, so the Rabbit Poutine was an obvious choice. Just thinking about the Cheddar Cheese Curds, Rabbit Sausage, freshly cut French Fries and Texas Pete Tomato Gravy makes my mouth water all over again. It's spicy, it's satiating, it's a very special dish. The Risotto is also not to be missed. English Peas, Pecorino Cheese, Pea Tendrils (the stem and leaves of the pea plant) and shaved Black Truffles make it exceptionally flavorful and fresh. The Honey Pot is still finding its footing, namely, what's in a name? I'm not quite sure I get the "honey" connection, unless it's hinting at a place where people will flock to. But the food and service is outstanding, so it comes with high recommendations from me.